Thank you for your interest in Gabe’s Chemo Duck Program. It is our mission to provide education and comfort to children with cancer through therapeutic tools and medical play. By signing on to be a part of our hospital program, you are committing your organization to making a difference in the lives of the children and families going through cancer treatment. 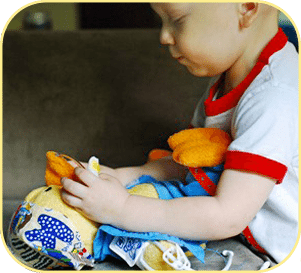 Gabe’s Chemo Duck Program is an opportunity for hospitals to provide each pediatric cancer patient with a soft, cuddly friend to assist them in understanding the changes in their lives and how to cope with what they are going through.On the FAQs page are some commonly asked questions regarding our hospital program. We hope they will answer your questions and encourage you to sign up for Gabe’s Chemo Duck Program. You will immediately see the positive impact this program has on your patients. Learn more about how to build a strong partnership with Gabe’s Chemo Duck and make the most out of our program at your hospital. 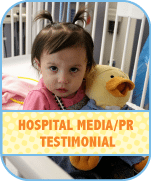 Check out this testimonial and learn how working with local media can help you keep Gabe’s Chemo Duck Program going at your children’s hospital!